X Sa grande queue en forme de nageoire lui donne une puissance d’accélération incroyable. Il est très costaud malgré sa taille. X Tiene una larga cola que le propulsa por el agua con mucha potencia. A pesar de ser pequeño, tiene mucha fuerza. X La grande pinna sulla coda gli conferisce una straordinaria accelerazione in acqua. È minuto, ma forte. X 커다란 꼬리지느러미로 물을 헤치면 스피드가 쑥쑥 오른다. 작은 몸이지만 힘이 장사다. Y Il analyse le courant grâce à la nageoire sur sa tête. Il est assez fort pour soulever des rochers. Y La aleta de su cabeza detecta las corrientes de agua y los peligros. Tiene fuerza para levantar rocas. Y Con la pinna sulla testa percepisce i movimenti dell’acqua e sta in guardia. Riesce a sollevare rocce. Y 머리의 지느러미로 물의 흐름을 느껴 주위의 상황을 파악한다. 바위를 들어 올릴 정도로 힘이 세다. 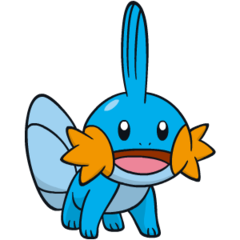 Omega Ruby In water, Mudkip breathes using the gills on its cheeks. If it is faced with a tight situation in battle, this Pokémon will unleash its amazing power—it can crush rocks bigger than itself. Omega Ruby Im Wasser atmet Hydropi durch die Kiemen an seinen Wangen. Wenn es im Kampf in eine brenzlige Situation gerät, setzt es seine verblüffende Kraft ein, mit der es Felsbrocken zerquetschen kann, die größer sind als es selbst. Omega Ruby Sous l’eau, Gobou peut respirer grâce aux branchies sur ses joues. S’il se retrouve en difficulté pendant un combat, ce Pokémon déchaîne ses pouvoirs incroyables. Il peut détruire des rochers plus gros que lui. Omega Ruby En el agua, Mudkip usa las branquias que tiene en los mofletes para respirar. Cuando tiene que enfrentarse a una situación delicada en combate, desata una fuerza asombrosa con la que puede destruir rocas incluso mayores que él. Omega Ruby In acqua Mudkip respira usando le branchie sulle mascelle. In caso di situazioni critiche nella lotta scatena la sua forza strabiliante, riuscendo a frantumare rocce più grandi di lui. Omega Ruby 물속에서는 뺨의 아가미로 호흡한다. 위급해지면 몸보다 큰 바위를 산산이 부숴버리는 파워를 발휘한다. Alpha Sapphire The fin on Mudkip’s head acts as highly sensitive radar. Using this fin to sense movements of water and air, this Pokémon can determine what is taking place around it without using its eyes. Alpha Sapphire Die Flosse an Hydropis Kopf dient als hochempfindliches Radar. Damit kann es Bewegungen im Wasser und in der Luft wahrnehmen. So weiß es jederzeit, was in seiner Umgebung passiert, ohne dabei seine Augen zu benutzen. Alpha Sapphire La nageoire sur la tête de Gobou lui sert de radar hypersensible. Il l’utilise pour sentir les mouvements de l’eau et de l’air. Ainsi, ce Pokémon peut savoir ce qui se passe autour de lui sans avoir à se servir de ses yeux. Alpha Sapphire La aleta que tiene Mudkip en la cabeza actúa de radar y es muy sensible. Puede captar movimientos que se produzcan en el agua y en el aire, y todo lo que ocurra a su alrededor, sin necesidad de abrir los ojos. Alpha Sapphire La pinna sulla testa di Mudkip agisce come un radar sensibilissimo. Usando questa pinna come sensore in acqua e in aria, riesce a determinare cosa succede attorno a lui senza bisogno di guardare. Alpha Sapphire 머리의 지느러미는 매우 민감한 레이더다. 물이나 공기의 움직임을 통해 눈을 쓰지 않고 주변의 상황을 알아낼 수 있다. 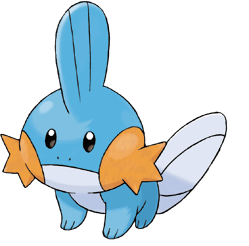 Ruby The fin on Mudkip's head acts as highly sensitive radar. Using this fin to sense movements of water and air, this Pokemon can determine what is taking place around it without using its eyes. Sapphire In water, MUDKIP breathes using the gills on its cheeks. If it is faced with a tight situation in battle, this POKeMON will unleash its amazing power - it can crush rocks bigger than itself. LeafGreen Its large tail fin propels it through water with powerful acceleration. It is strong in spite of its size. Diamond To alert it, the fin on its head senses the flow of water. It has the strength to heft boulders. Pearl To alert it, the fin on its head senses the flow of water. It has the strength to heft boulders. Platinum To alert it, the fin on its head senses the flow of water. It has the strength to heft boulders. SoulSilver Its power can crush boulders. It rests by covering itself with mud at the bottom of a river. Black To alert it, the fin on its head senses the flow of water. It has the strength to heft boulders. White To alert it, the fin on its head senses the flow of water. It has the strength to heft boulders. White 2 To alert it, the fin on its head senses the flow of water. It has the strength to heft boulders.